Sen. Bernie Sanders, an independent who became an ideological leader in the Democratic Party after his 2016 campaign against Hillary Clinton, faces a far more crowded and liberal field this time. But this 2020 bid will undoubtedly be a very different presidential campaign than his quest for the Democratic nomination as an underdog in 2016. Sanders enters the race as a top contender who, along with former Vice President Joe Biden, tops most early polls, far outpacing other Democratic candidates in support and name identification. It's a sharp contrast from when Sanders seemingly came out of nowhere to surprise the political class — and at times himself — by winning several key primaries against former Secretary of State Hillary Clinton. Buoyed by a big early win in New Hampshire, Sanders fought Clinton for the Democratic nomination through the final June contests, drawing tens of thousands of supporters to rallies in the process. In the years since his loss to Clinton, Sanders has remained a national leader of the Democratic Party, though he still refuses to join. "I think we have had real success in moving the ideology of the Democratic Party to be a pro-worker party, to stand up to the billionaire class," Sanders told NPR during the 2018 midterms. "We've got a long way to go." 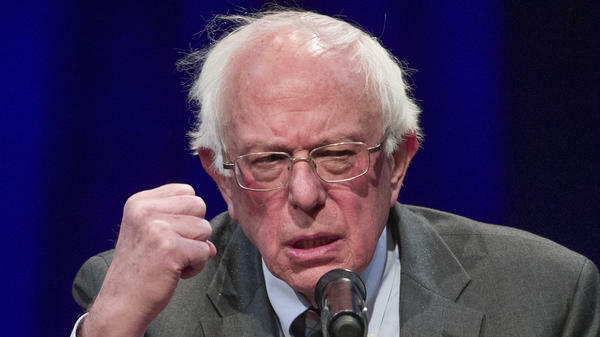 Many of the issues he has promoted for years — most notably a Medicare-for-all national health care plan and a $15 an hour minimum wage — have shifted from the party's fringe to its mainstream, and are now seen as effective litmus tests for presidential candidates. Indeed, Sanders' most recent Medicare-for-all bill was cosponsored by fellow presidential candidates Sens. Kamala Harris, Kirsten Gillibrand, Cory Booker and Elizabeth Warren. The Senate's other presidential candidate, Amy Klobuchar, co-sponsored Sanders' most recent $15 minimum wage bill, in addition to the other four. Sanders pointed to the Democratic Party's leftward shift as a reason for a second run. "It turns out that many of the ideas that I talked about — that health care is a right, not a privilege, and that we've got to move toward a Medicare-for-all, single-payer system: very, very popular. The idea that we have got to raise the minimum wage to $15 an hour," he told Vermont Public Radio. "When I talked about making public colleges and universities tuition-free and lowering student debt, that was another issue that people said was too radical. Well, that's also happening around the country." But running in 2020, Sanders could be a victim of his own success. While Sanders provided liberal Democratic primary voters with a sharp contrast to Clinton's political pragmatism in 2016, progressives will have no shortage of candidates to choose from in the increasingly broad and diverse 2020 field. Most declared Democrats support Sanders' vision of nationalized health care, and more robust federal programs and policies, all funded by higher taxes on top income earners. And in a party that has placed an increasing premium on being more representative of the broader electorate and country in recent years, many other candidates will offer voters the 77-year-old's platform — with the added benefit of youth and diversity. "My question is, does he provide added value in this campaign for 2020? Or are there a lot of people who sort of carry very similar messages? Does it have to be him? I don't think it does, and I admire him," New Hampshire radio host Arnie Arnesen, a 2016 Sanders supporter, recently told NPR. "I think it's time for us to start creating a new bench. And the new bench isn't old, it shouldn't be white and it probably shouldn't be male." Asked by Vermont Public Radio how he will pitch his candidacy in such a diverse and progressive field, Sanders argued, "We have got to look at candidates not by the color of their skin, not by their sexual orientation or gender and not by their age. I think we have got to try to move us toward a nondiscriminatory society that looks at people based on their abilities, based on what they stand for." There have been hurdles as Sanders prepared to run again in 2020. His campaign has had to answer to charges of sexism and harassment by staffers in 2016, with his former campaign manager acknowledging "a failure." Sanders also had to clarify comments about the role of racism in the 2018 campaign, addressing the losses of gubernatorial candidates Andrew Gillum in Florida and Stacey Abrams in Georgia. Sanders took several steps to maintain his national political profile and strengthen his presidential prospects in recent years, including his support for Democratic candidates in 2018. Frequently criticized by the Clinton campaign during 2016 for ignoring foreign policy, he delivered several high-profile speeches laying out a progressive worldview that attempts to thread the needle between a broad, America-As-World-Police approach to international politics, and President Trump's isolationist views. Sanders also played a lead role opposing Republican attempts to repeal the Affordable Care Act and engaged with the Democratic National Committee that famously opposed his 2016 campaign, as revealed in internal emails stolen by Russian hackers and posted to Wikileaks. In the wake of the 2016 campaign, the DNC changed its presidential nominating process, in part by largely removing party leaders known as "superdelegates" from influencing the selection, a move Sanders supported. Senator Bernie Sanders is giving it another run. He announced this morning in an interview with Vermont Public Radio that he is launching a campaign for president in 2020. BERNIE SANDERS: We began the political revolution in the 2016 campaign, and now it's time to move that revolution forward and make sure that those - that vision, those ideas are implemented into policy. GREENE: The Vermont senator led a massive progressive movement as he challenged Hillary Clinton for the Democratic nomination in 2016, and he will need to reconstitute that again to win in 2020. NPR's Scott Detrow is covering the 2020 campaign. He's with us. GREENE: All right. So there was some uncertainty for some time about whether Sanders would actually do this. He's now making it official. So why is he running this time? DETROW: Well, he's making an argument that if you look at how we ran in 2016, he was criticized by a lot of Democrats for being too extreme, not realistic in the policies he was talking about. Three years later, a big chunk of the Democratic Party has signed on to a lot of his proposals, things like "Medicare for All," a $15 minimum wage. You know, nearly everyone else running for president is campaigning on those policies. SANDERS: We intend to run a campaign which stands up for working people, whether they're black or white, Latino, Native American, Asian American. We are going to run a campaign which tells the people on top that their greed has got to end, they cannot get it all. We are the wealthiest country in the history of the world. We cannot continue to have three people owning more wealth than the bottom half of the American people, cannot continue to have kids unable to afford to go to college, 30 million people without health insurance, family farmers going out of business. We can do a lot better. DETROW: You know, the field running is very diverse. It's much younger, and Bernie Sanders is older. He's 77 years old. And of the six U.S. senators to announce they're running for president, he's the first white male to jump into the race. But Sanders is a top contender this time. Along with former Vice President Joe Biden, he's leading or No. 2 in nearly every poll so far. GREENE: You have to believe he's been at least laying the groundwork for giving him the option to do this since 2016. So what has he been doing to make sure that that movement kept its momentum? DETROW: You know, a lot. He never actually joined the Democratic Party and still won't. But he did become a member of the Democratic leadership of the Senate. He took a high-profile role in a lot of public fights, including trying to stop the Republican Obamacare repeal. He was doing a lot of campaigning the last few years. And one early sign to me that he was not only serious about running again but trying to win was that, you know, he was really knocked by Hillary Clinton in her campaign for not taking foreign policy seriously in 2016, not really ever talking about it. Over the last couple of years he's made a very concerted push to have more to say on foreign policy, give a lot of speeches on that front. And if you recall a couple months ago when the U.S. Senate voted to try and force the U.S. out of involvement in the war in Yemen, it was actually Bernie Sanders who led that push, who authored that bill. GREENE: Scott, I mean, it's a good thing for Sanders that so many other candidates have come sort of to his message. But couldn't that also be a bad thing for Sanders if the field is much more crowded now than the field he had in 2016? DETROW: Absolutely. And go back to that point that nearly every other Democrat running for president is campaigning on "Medicare for all." Now you know, if you're a progressive voter, you have options. You can't just - it's not just Sanders out there offering that. You have a lot of different choices running on a lot of the exact same things that he's run on for years. So he's going to have to carve out a space in a much more crowded and progressive field than he had before. And that's going to be a lot bigger challenge than last time. GREENE: NPR's Scott Detrow talking us about the news that Bernie Sanders is running for president again in 2020.